Placebo has cancelled its Wolverhampton show due to take place next week. “We are bitterly disappointed and incredibly sorry to have to cancel these shows. "We desperately wanted to complete the tour campaign and go out on a high following the previously postponed dates. "We know how much these shows mean to so many of you and we hate to let you down. "Thank you to those of you who have shown understanding and support, it means a great deal to us." 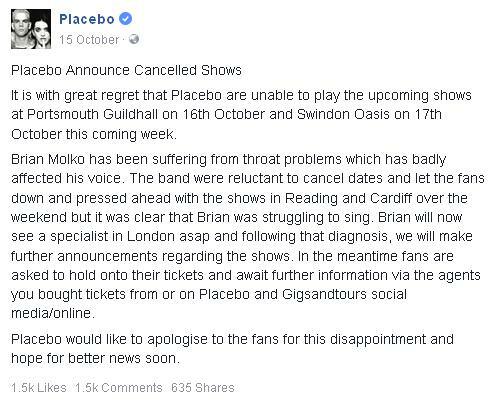 "Brian Molko has not recovered from his ongoing throat problems, and despite regular specialist treatment and support, he has now been advised that his throat and voice are unlikely to be recovered by next week. "Brian is therefore required to undertake further exploratory treatment and complete rest. "All tickets will be refunded at point of purchase from 10am on Friday 17th November." The band has also cancelled its Portsmouth and Plymouth dates. MTV Unplugged is a live album by the English alternative rock band Placebo. It was released on 27 November 2015. Recorded on 19 August 2015 at The London Studios, it is part of the MTV Unplugged series. 1:06:24 Where Is My Mind?